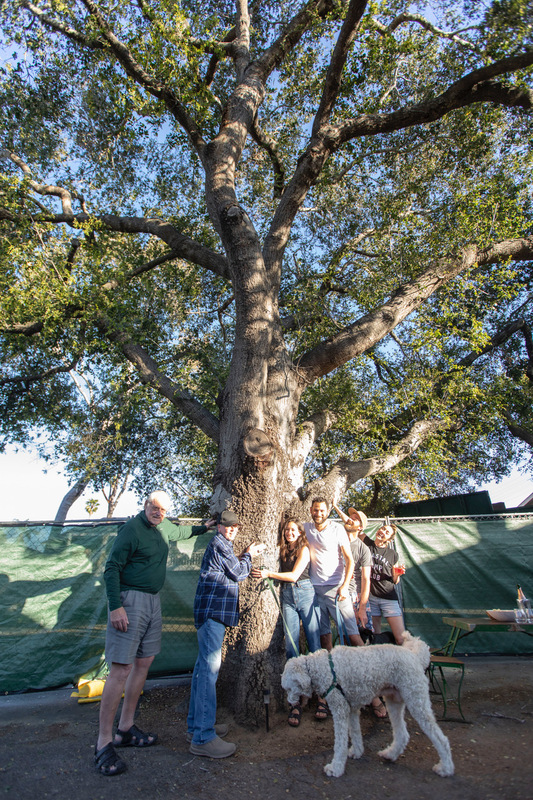 Just as The Lorax speaks for the trees, the Ravenhill family and their neighbors gave a voice to the voiceless recently when they saved the life of a decades-old oak tree on Castillo Street. The towering Coast Live Oak, a downtown habitat for birds of prey and other wildlife, was going to be cut down to make way for development. In March, community members celebrated the city parks commissionâ€™s decision to deny the removal â€” as well as the developerâ€™s failure to appeal. Homeowners and longtime renters galvanized late last year when they learned that San Franciscoâ€“based developer Arvand Sabetian had submitted plans to remove the oak from the public alleyway adjacent to the investment property he purchased at 1124 Castillo Street. Geoffrey Ravenhill and his wife, Lauren, live next to the property. â€œEvery morning, we wake up, drink coffee, and birdwatch,â€ said Geoffrey Ravenhill, who recently saw a hawk in the oakâ€™s branches. Around the oak stand modest family homes, many of which are around 100 years old. In October 2018, Sabetian filed his plans to remove the tree as part of a project to construct a two-story building with seven residential apartment units under the Average Unit-Size Density (AUD) incentive program. The plan included the construction of a 10-space parking lot, with the remainder of the existing building to be converted to three hotel units. Ravenhill, acting as a spokesperson for the neighbors, emailed Sabetian about his concerns. â€œCommunication between the community and the developer early on is really important,â€ Ravenhill said. According to the development plans, the tree would get in the way of the proposed parking and its canopy would curtail the breadth and height of the project. â€œTo us, this really distilled the issue: Does it make sense to destroy this city-owned tree in order to benefit one San Franciscoâ€“based developer?â€ said an opponent of the treeâ€™s removal. To navigate the bureaucratic process, Ravenhill and other neighbors contacted Tim Downey, Santa Barbaraâ€™s Urban Forest Superintendent, and consulted with the Environmental Defense Center. The neighbors were advised to attend a meeting of the Street Tree Advisory Committee (STAC), which makes recommendations on tree removals in the city. On the morning of February 7, half a dozen neighbors showed up to the meeting to voice concerns. According to STAC, the oak tree is 85-100 years old and could live for another 200 years. The committee recommended to deny the developerâ€™s removal application. But, the decision wasnâ€™t final yet; it still needed to be reviewed by the Santa Barbara Parks & Recreation Commission. Santa Barbara has been grappling with such decisions for years. As developers continue to build downtown, â€œthereâ€™s a noticeable amount of mature trees being cut down and either not being replaced or being replaced with something that doesnâ€™t have a canopy,â€ one neighbor said. On February 27, even more neighbors showed up for the Parks & Recreation Commission hearing, where the commission took the STACâ€™s recommendation under consideration in making a final determination. â€œIâ€™ve seen red-tailed hawks, Cooperâ€™s hawks, kestrel falcons, and even a merlin falcon flying into, out of, or roosting in [the oak tree],â€ said Louis Andaloro, a retired wildlife biologist who passes the tree on his evening walks. The Parks & Recreation Commission unanimously passed a motion to accept the STAC recommendation and deny the removal of the oak. However, before they could celebrate, the neighbors had to see if the developer was going to appeal. They waited 10 long business days, after which the window for the appeal expired. On Sunday, March 17, the neighborhood group gathered beneath the tree to celebrate their victory with a toast of champagne. Ravenhill says he hopes his communityâ€™s success story will inspire other residents to stand up and protect trees in other wildlife-impoverished areas where development is encroaching. â€œOur community is, at its core, a gathering of neighbors coming together for a common cause, just like this,â€ he said.